Jim Cramer believes in gold as something that belongs in everyone's portfolio. "Cramer said gold remains his favorite sector in the market, but he cautioned that even in a horrible market, investors can't have just gold in their portfolio." Cramer is in good company. Alex Dumortier, CFA, on the Motley Fool site has reassured us all that gold may well be the "Ultimate Safe Haven Investment." "For these reasons, and because of my deep misgivings about the way in which the government is taking on the current crisis, I think gold is an attractive choice as a portion of one's investable assets. I believe conditions look very favorable for gold to outperform the U.S. stock market in 2009 and over the next three to five years. Still, investing in gold isn't without its challenges." "Gold is renowned as a hedge against inflation. The most consistent factor determining the price of gold has been inflation - as inflation goes up, the price of gold goes up along with it. Since the end of World War II, the five years in which U.S. inflation was at its highest were 1946, 1974, 1975, 1979, and 1980. During those five years, the average real return on stocks, as measured by the Dow, was -12.33%; the average real return on gold was 130.4%. Today, a number of factors are conspiring to create the perfect inflationary storm: extremely stimulative monetary policy, a major tax cut, a long term decline in the dollar, a spike in oil prices, a mammoth trade deficit, and America’s status as the world’s biggest debtor nation. Almost across the board, commodity prices are up despite the short-term absence of a weakening dollar which is often viewed as the principal reason for stronger commodity prices." Jason Hamlin back in 2006 wrote on Seeking Alpha how "Gold Still Works as an Inflation Hedge." Now, with deflationary pressures exerting their influence on the world economy, gold 'bugs' are suggesting that gold is also an excellent deflation hedge! During periods of deflation, when spending shrinks and savings (in anticipation of lower consumer prices) rise, households hoard cash and cash-equivalents such as short-term U.S. Treasury debt, bank deposits, and money-market instruments. Gold and silver are also a cash equivalents and some will choose to hold more of their savings in these metals, particularly during times of stress and economic uncertainty when gold just feels safer. Moreover, deflations are also characterized by very low interest rates, both in nominal and real (inflation-adjusted) terms. Why? Because the demand for credit is very low (no one wants to borrow and, if they do want to borrow, the banks are loathe to lend), savings are high, and — importantly — the Fed and other central banks will push rates down to encourage economic recovery. So the opportunity cost of holding gold and silver (the interest forgone by holding these metals rather than an interest-bearing asset) is extremely low, further encouraging some investors to favor the metals (because of gold and silver’s other attractions and attributes) over alternatives." It is an interesting hypothesis. And I suppose that we could use this argument to justify the high price in gold and Cramer's rant about buying gold stocks. Perhaps a more revealing chart comes from the Gold Digest, in which it is noted that after the "Japanese Bubble" broke in 1988, the Yen gold price fell almost 50%. "The above empirical evidence is consistent with our thinking on the matter. When gold was officially linked to the national currencies (pre-1971), it was a hedge against deflation and would lose purchasing power during periods of inflation. When gold was 'set free' it became a hedge against inflation (or, more to the point, a hedge against the loss of confidence brought about by inflation)." In other words, since the dollar is no longer linked to the price of gold, the deflation-protection role of gold is minimized. American investors have gone through several bubbles, each one breaking and sending shock-waves through the economy. The "Dot-com bubble" burst on March 10, 2000, with the NASDAQ peaking at 5,132.52. We have seen the effect of the breaking of the United States Housing Bubble. We have benefited from the declining oil prices of the breaking oil bubble which peaked at $147.20/barrel in July, 2008, to its current price near $40. "Everything that's old is new, and everything that's new is old." "In a paper the two presented at the Brookings Institution this week, "Bubble, Bubble, Where's the Housing Bubble?" they said that even though prices had risen rapidly and some buyers unrealistically expected the trend to continue, "the bubble is not, in fact, a bubble in most of these areas." They argued that the value of a home is determined by the rent it could fetch. Calculate the future rents, subtract mortgage payments, taxes and other costs, factor in a good annual rate of return of 6 percent or more, and one should be looking at the proper price of a house or condo. Their bottom line was: "Buying a house at current market prices still appears to be an attractive long-term investment." Thus there will always be people who will justify a bubble phenomenon. Meanwhile Real Estate prices are crashing, milk prices have plunged, corn and soybean prices are down, aluminum prices are weak, and wages are stagnant. Meanwhile, the United States is in the midst of a "severe contraction", and the United States is threatened with a deflationary collapse and not inflationary problems at this time. Will gold move higher in a deflationary environment? Perhaps, if you believe Cramer and other gold bugs who believe that gold can reach $2,000/ounce or higher. As for me, with gold not linked to currency in the United States since President Nixon took the nation off the gold standard in 1971, I do not see a necessary increase in the price of anything, including gold, in a deflationary environment. While cash may be 'king' in a deflationary environment, will investors truly treat gold as a 'cash equivalent' or will it act perhaps more like a commodity? Certainly I am not an economist, but can't you hear the echos of the same arguments that justified $146 oil when the bubble was breaking, or the real estate investor who justified the $1 million 'tear-down' in Southern California when the sky was the limit. It appears to be part of the human condition to chase values of seemingly rare things to levels that are absurd. Is the gold price real? Time will tell. But I shall not be going along for the ride. I wrote earlier in this blog about my own experience with Prostate Cancer. If you are a man over 50 and haven't had your PSA level checked, go out and get it done. It may save your life. I can remember these words from this past summer as my urologist came into my own clinic where I was taking care of my patients with their eye problems to let me know that things weren’t quite perfect for me. I let my wife know the result of the biopsies. My son hurriedly rushed in from Madison that evening; his best friend’s dad had recently died from cancer and he was shaken. I called my other children and my sisters and brother in California to share with them the news. I was at times fearful of this event; but I knew enough to be guardedly optimistic. After the age of 50, as is recommended, I started having PSA levels drawn with my physical exam to screen for prostate cancer. The science of Prostate Specific Antigen levels is somewhat imprecise. What is most important is called the “velocity” of the test levels. For me, a year ago, I had a level of around 3.0. On the upper-level of acceptable, I was encouraged to get this repeated this year and indeed this time it came in at 5.3—enough to warrant further investigation to rule out cancer; this included an ultrasound test and a series of 10 or 12 needle biopsies of the prostate. My urologist reassured me that odds were in my favor—that the tests were unlikely to come back as cancer. Thus when he showed up in my office and told me we should talk further about the biopsies a few days later, I knew my luck hadn’t been that great, and that indeed I now faced further decisions. I made an appointment to visit with him with my wife and decide about the next steps. It is estimated that about 180,000 men in America were diagnosed with prostate cancer in 2008. I was one of them. Fortunately, early detection of this disease now meant that a cure was within reach regardless of my choice of treatment. At 53, ‘watchful waiting’ which might be appropriate for a man in his 80’s for this slow-growing cancer wouldn’t be an acceptable choice for me. Thus, I could choose surgery—either the traditional radical prostatectomy or the newer robotic approach—-or I could decide to have either a seeding procedure with radioactive particles or external beam treatments. Either radiation or surgery has yielded similar outcomes with over 85% of men at 10 years being cancer-free. I wasn’t really convinced that 85% was so great. After all, that meant that one man out of seven would experience a recurrence in that time period. And in fact, it is estimated that 28,000 men died from their prostate cancer in 2008. Nothing was for sure. Being a surgeon myself, I leaned towards a surgical approach. I recall how the surgical residents would always joke that “a chance to cut is a chance to cure”. Personally, I liked the idea of removing any cancer from my body and dealing with the post-op surgical challenges rather than dealing with any small but real side-effects of radiation therapy. To understand my options better I visited with both a surgeon skilled in the new robotic approach to surgery on the prostate and a radiation oncologist who advised me about that regimen. There wasn’t a “correct” answer to which was better. I chose robotic surgery and as suggested I took a month off to recover from surgery before getting back to my own medical practice. It was very different being a patient on a gurney waiting to be rolled into an O.R. as opposed to being the surgeon waiting for my own patients to arrive for their own operations. It was comforting to be cared for by talented medical personnel at every level of the process. The results of surgery were encouraging. The tumor was limited to the prostate and all lymph nodes were negative. At this point, I just needed to be monitored and have PSA levels drawn on a regular basis. Other men have required hormonal therapy or radiation treatments. If my own tumor recurs, I shall also need additional therapy. It has now been three months since my surgery. My first PSA test has returned at levels near zero so the outlook continues promising. Just like so many other cancer survivors, I too am anxious about my next medical exam to know if I am free of disease. But I have been fortunate to have a disease that is potentially curable; not every cancer patient is that lucky. Dr. Robert Freedland is an ophthalmologist at Franciscan Skemp Healthcare. New PODCAST on Portfolio Management in the Face of a Bear Market! 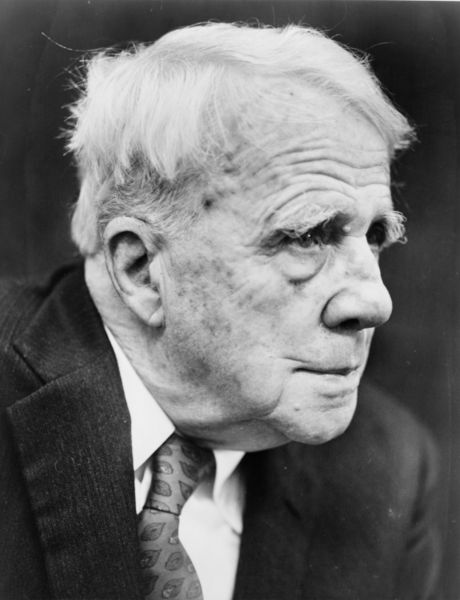 Click HERE to listen to my latest podcast on Investment Management Strategy in the face of a bear market as well as listen to me read a few poems by Robert Frost. As I wrote earlier, I was disappointed in needing to sell my Morningstar (MORN) shares this morning as that stock fell under the pressure of a disappointing earnings report as well as the generalized weakness in the financial sector. One stock that I have been watching as a possible 'safe haven' has been AT&T (T) which as I write is trading at $23.60, up $.41 or 1.77% on the day. AT&T at this price trades with a p/e of only 10.92 and a yield of 7.07%. A few moments ago I purchased 71 shares of T at a price of $23.64. This peculiar share amount was calculated as I have described previously by calculating the average size of my other four holdings and buying 1/2 of that average amount to replace my 5th position, Morningstar (MORN), which was also sold just this morning. Scott Moritz over at Street.com commented about how Goldman Sachs analyst Jason Armstrong has upgraded both Verizon (VZ) and AT&T (T) and both stocks have responded positively. "With AT&T and Verizon down about 18% so far this year, Armstrong says the "pendulum has swung too far" and that it's time to consider the long-range perspective. In a research note Friday, Armstrong recommends buying shares of the two telco titans now, while pessimism about the economy is weighing so heavily on the market. Why now? Armstrong has three points: The bar has been lowered in terms of Wall Street expectations, both telcos have "an achievable path to growth in 2010," and both offer a big, safe dividend -- about 7% annual payout -- to help you bide your time." Looking at the 4th quarter earnings report you will see that I have also accepted a less than stellar report with earnings coming in at $.41 this year down from $.51/share in the prior year. Revenues did manage to improve slightly to $31.1 billion, up 2.4% from last year's results. Reviewing the Morningstar.com '5-Yr Restated' financials, we can see the impressive growth in revenue from $40.7 billion in 2004 to $118.9 billion in 2007 and $123.3 billion in the trailing twelve months (TTM). Earnings have grown, albeit a little inconsistently, from $1.77/share in 2004 to $1.94/share in 2007 and $2.26 in the TTM. Dividends have also been raised yearly from $1.26 in 2004 to $1.47 in 2007 and $1.60 in the TTM. Shares have also grown from 3.3 billion in 2004 to 6.17 billion in 2007 and 6.01 billion in the TTM. Much of this share growth may be attributed to shares issued for acquisitions. I remember well the original break-up of 'Ma Bell' in 1983 when the seven 'baby bells' were created. In 1998 SBC Communications acquired Pacific Telesis, the baby bell for the western states. In November, 2005, SBC Communications (the old baby bell Southwestern Bell) acquired AT&T and renamed itself AT&T. In 2006, AT&T spent $67 billion to acquire BellSouth. I confess to having a personal attraction to AT&T that transcends the stock and its particulars. Years ago, when my father was still alive, I really believe that AT&T was his favorite holding. He had owned it for many years and enjoyed the dividend stream and the many stock splits over the years. A while back I wrote about him and my own investing experience. But that shouldn't really enter into our own investing decisions, should it? 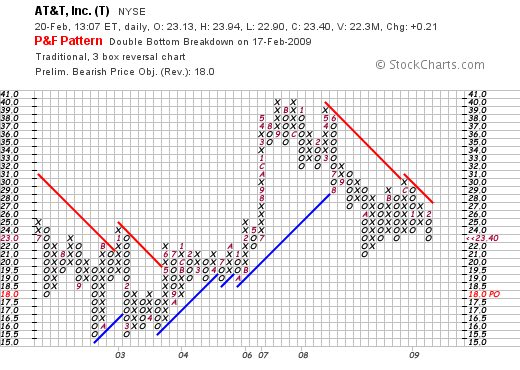 Let's take a brief look at the 'point and figure' chart on AT&T from StockCharts.com. Here we can see that the stock which corrected rather deeply in September, 2002, dipping to $15.50/share, revisited that low in Apri, 2003, and then climbed as high as $40/share in September, 2007, and again hit that high in December, 2007, only to dip as low as $21 in October, 2008. The stock has been struggling to move higher, with higher lows but meeting resistance on the upside. The stock is bouncing off the recent low of $23.00 from November, 2008, and now is showing some support at this price point. Like most charts these days, the picture is less than encouraging. But if the dividend is secure, something we cannot depend on anymore, the stock may well be support in a bond-like fashion. In any case, I am now a shareholder, albeit a small shareholder, in an 'old favorite' of if not mine, of my father who while no longer alive, was always my main mentor in this stock business. Earlier this morning I detailed my strategy for dealing with stock declines. Little did I anticipate that I would so quickly be exercising that strategy in an unexpected decline of what I would otherwise tell you is a 'favorite' stock of mine, Morningstar (MORN). As I write, Morningstar (MORN) is trading at $28.01, down $(4.52) or 13.89% on the day. I acquired my 116 shares of Morningstar just a month ago, on January 21, 2009, at a cost basis of $33.53. A few moments ago I sold all of my shares at $28.00, for a loss of $(5.53) or (16.5)% since purchase. My sale point after an initial purchase is at an (8)% loss. Since I enter these sales and purchases manually (rather an old-fashioned approach I suppose), this stock price blew right by my sale point and I incurred an even larger loss on this investment than I would prefer to take. In any case, the stock triggered a sale for me and I am now down to four positions: 50 shares of Haemonetics (HAE), 90 shares of PetSmart (PETM), 350 shares of Rollins (ROL), and 154 shares of Sysco (SYY). Being under my minimum, instead of 'sitting on my hands' with this sale, I actually have a 'buy signal' to be adding a fifth holding to get back to my minimum of 5 positions. However, instead of looking to add a slightly larger position as I would do if I were at at least 5 positions, by making a purchase of 125% of the average size of the remaining holdings, I shall continue to shrink my exposure by buying a position at 50% of the average size of the remaining four holdings. Looking for what triggered that downside move today, we can see that Morningstar (MORN) reported 4th quarter 2008 results yesterday after the close of trading. Revenue came in at $119.3 million, slightly ahead of last year's result of $118.1 million. Net income for the quarter came in at $19.3 million or $.39/share down 3.7% from the $20.0 million or $.41/share the prior year. While this result is not what one surprising in light of the overall weakness of the economy, what likely triggered the rather extreme move was the fact that analysts had been expecting $.43/share according to Reuters estimates in the same article. Thus the company disappointed and failed to meet expectations. Contributing to this drop in net income was the combined facts that "assets under advisement fell about 32% to roughtly $66 billion" according to CEO Joe Mansueto. In addition, the company's own expenses rose in conjunction with acquisitions to 2,375 from 1,720 employees. The market did not take lightly to these results. I still like this company, but I am definitely obligated to sell the holding within the framework of my own investment strategy as well as the announcement of fundamentally poor results. I shall keep you posted on what and if I make a small purchase to bring my holdings back to my minimum of five. If you haved any comments or questions, please feel free to leave them on the blog or email me at bobsadviceforstocks@lycos.com. Many of you who visit this blog are used to my stock market ideas that really are based on a combination of price momentum and fundamentals. I continue to believe that this basic idea about selection of stocks is sound and important for every investor to consider---whether they be novices or pros in stock selection. Simply put, I sell my gaining stocks slowly and partially at targeted appreciation points and sell my losing stocks quickly and completely at pre-determined levels. Let me explain this process one more time. For my own use, I have set my holdings at a limit of 20 positions. Currently I am holding five stocks. In initially entering the market, I would suggest that an investor start at 50% cash and 50% equities---a position that I would describe as "neutral". In other words, commmitting 5% of cash to each of the ten positions. As a saver, I would also encourage the automatic deposit monthly of whatever amount is appropriate to each saver to grow each account over the 'long haul'. After reaching this point, I would allow the market to determine future responses to the portfolio. On selling stocks on the upside, I still recommend selling 1/7th of each holding at certain appreciation points---for me I utilize gains at 30%, 60%, 90%, and 120% levels, followed by larger intervals reaching 180, 240, 300 and 360%, then 450%, 540%, 630%.....etc. At each sale at a gain, I view this as a signal that the market is "o.k." and give myself a 'permission slip' to add a new holding....unless I am at the maximum of 20....in which case the sale would simply go into cash or paying down margin as the case may be. Sizing of sales (above 5 positions---the minimum) are now set at 125% of the average holding size for the new position. On the downside after an initial purchase I allow an (8)% loss to completely step out of a holding. After a single sale at a 30% gain, I sell the entire position at 'break-even'. If I have sold a stock more than once, for instance 3 times at 30, 60 and 90% levels (selling 1/7th of my holding each time), I sell if the stock should decline to 1/2 of the highest percentage level----for 90% appreciation sale, I would sell the entire position should the appreciation level decline to 45%. With these sales I 'sit on my hands' unless I am at my minimum of five holdings, in which case I replace that holding with a smaller sized position which would also decrease my exposure to equities. The smaller-sized position, instead of being 125% of the average, the size of a new position on the upside above 5 positions----the smaller-sized position is at 1/2 of the average size of the remaining holdings. I believe it would help any investor step aside in a bear market like we are continuously being exposed to. It is working in this regard for me. It isn't rocket science. It is common sense. Thanks again for stopping by. I shall be going off to work in my 'day job' now. If you have any comments or questions, please feel free to leave them on the blog or email me at bobsadviceforstocks@lycos.com. A Reader Writes "CTSH, HAE, and ALXN---Your Thoughts?" "CTSH looks like a screaming buy. HAE has been behaving well, and ALXN looks very interesting and insulated from the economic fiasco. No current positions." First of all, thank you for writing once again Doug. Since I have been spending much time on my own stocks the past few months, I would like to take a look at the stocks that you mentioned. As you probably realize, I do own a small position in Haemonetics (HAE), but I haven't looked at Cognizant (CTSH) since way back on July 22, 2003. I don't believe I have ever really examined Alexion Pharmaceuticals (ALXN), so that one will be a completely new stock for me and for this blog. In reviewing these three stocks, let's look at four basic items that may well determine our assessment. First of all the news. Is there any recent news item that is of signifance that will affect our current assessment of the prospects of this stock? And I suppose, when considering the news, we can also consider the context of the current economic "fiasco" as you appropriately describe our current economy. Next, as I like to do, let's take a quick look at the latest quarterly report. Were earnings growing, revenue increasing, and did the company meet, beat, or fail to meet expectations? And did the company comment on guidance? Thirdly, let's review the Morningstar.com '5-yr restated' reports. What has been happening to the revenue, earnings, free cash flow, dividends, and what about the balance sheet? Finally, what about the chart? Is the stock price in a 'free-fall' or does it show any support from investors? In the case of Cognizant (CTSH), the "news" includes the latest earnings report. Since this company relies heavily on Indian workers for oursourcing, I would certainly be concerned that Cognizant could feel some of the effects of the Satyam disaster, but apparently this is not a problem for this particular company. Cognizant closed at $21.17 on February 13, 2009, up $.41 or 1.97% on the day. On February 13, 2009, Cognizant (CTSH) reported 4th quarter 2008 results. They met expectations with net income coming in at $.38/share or $112.3 million compared to the prior year $96.3 million or $.32/share. Revenue also increased nearly 26% to $753 million from $60 million the prior year. However, this news story suggests that removing special items (including weakness in the British pound relative to the U.S. Dollar affecting earnings by $(.03)), CTSH actually earned $.41/share and beat expectations. Reuters reported that the company reduced guidance for 2009: first quarter revenue at least $735 million vs. estimated $746.6 million, and 2009 earnings of at least $1.54 vs. estimated $1.59 million. Full year 2009 revenue now estimated at $3.1 billion vs. estimated $3.07 billion. "...a modest pick-up beginning the second quarter, as it sees a "stream of projects" that supports its assumption of a return to sequential growth in the quarter"
Clearly, while a satisfactory current quarter report, the company does appear to indicate that it too is not immune from the global economic stress. In terms of longer-term results, the Morningstar.com "5-Yr Restated" financials page is quite strong with no evidence at all of any weakness. And if we review the StockCharts.com 'point & figure' graph on Cognizant (CTSH), we can see that the stock appears to be moving higher, having bottomed at around $14.50 in November, 2008, and at least for the short-term, is moving past resistance at the $21.17 level. Doug, I would say that Cognizant is interesting. I am a bit concerned about the comments in the latest quarter about short-term issues in the upcoming quarter. I do like their historic record and the chart is encouraging. It definitely belongs on the watch-list, if not in your portfolio at some time in the future. In terms of Haemonetics (HAE), this is a company I am well familiar with as I currently own shares of HAE in my own trading account! I even made a podcast on Haemonetics back on November 16, 2008! 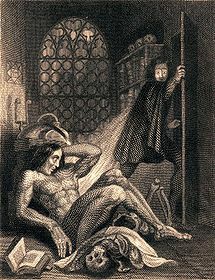 Haemonetics (HAE) closed at $61.01 on February 13, 2009, down $(1.33) or (2.13)% on the day. I know that I am biased because like a proud parent I own this stock, but looking at the latest results, 3rd quarter results were reported on February 2, 2009. The company beat expectations with earnings growth of 13% to $.63/share up from $.54/share the prior year....analysts had expected a profit of $.61/share. Revenue increased 16% to $155.4 million from $134.6 million....analysts had expected revenue of $144.9 million. In addition the company raised guidance on both earnings and revenue for fiscal 2009. Except for a dip in earnings between 2006 and 2007, the Morningstar.com "5-Yr Restated" financials also are quite solid. Reviewing the 'point & figure' chart from StockCharts.com on Haemonetics, we can see that the stock, while under pressure from October, 2008, through November, 2008, appears to be showing some renewed strength and having broken through 'resistance' is moving higher, at least for the short-term. Haemonetics (HAE) is certainly a favorite of mine. I like their latest earnings, their optimistic outlook, and the chart is encouraging. Of course, we need to consider that larger pressures of the economy may affect any business activity, Haemonetics included, but from the look of things, this one is a keeper. Finally, Alexion (ALXN). According to the Yahoo "Profile" on Alexion, this company "...primarily engages in the discovery, development, and commercialization of biologic therapeutic products for the treatment of severe disease states, including hematologic diseases, cancer, and autoimmune disorders." Alexion (ALXN) closed at $39.91, down $(.26) or (.65)% on the day. This is a $3.1 billion market-cap company which just reported 4th quarter 2008 results that were quite impressive. Earnings came in at $.17, beating estimates by $.09/share, and revenue came in up over 100% at $77.4 million in the quarter. "...derives all of its revenue from Soliris, which treats paroxysmal nocturnal hemoglobinuria (PNH). The rare genetic disorder can lead to anemia, fatigue, pain and difficulty in breathing." The company also raised guidance for 2009 to $1.00 to $1.05 in earnings on $360 to $375 million in revenue. Currently analysts had been expecting Alexion to earn $.87/share on $381.6 million in revenue. If we review the Morningstar.com "5-Yr Restated" financials on Alexion, we can see that revenue was only $1 million in 2005, and by 2007 this had increased sharply to $72 million. The company has reported $216 million in the trailing twelve months (TTM). The company has only just turned profitable and is still burning through cash with a negative free cash flow (which has also improved recently). The balance sheet is satisfactory. Looking at the 'point & figure' chart on Alexion from StockCharts.com, we can see the sharp rise in price from May, 2006, when the stock was trading at $15.00/share to a peak in July, 2008, when the stock was as hjigh as $47.00/share. The stock dipped, along with so many other companies, between August, 2008, and November, 2008, when it pulled back to a level of $29.00/share. Since then the stock has broken through resistance and appears to be moving higher at least for the short-term. Alexion is an interesting company. But for me a bit risky in that it is a one-product pharmaceutical firm. Even though this may well be a terrific opportunity, too much depends on this one drug. The company does have some other products in the pipeline. Doug, thinking about these three companies, I find myself still liking Haemonetics (HAE) the best, especially with the steady and increasing results. I am a bit concerned about Cognizant (CTSH) with the lowering of guidance for the upcoming quarter, and I am a bit wary of investing in a 'rocket-stock' like Alexion which, while growing quickly, depends so heavily on a single product. I hope that is helpful. Meanwhile, I appreciate your comments and emails and if anyone else would like to comment on this or anything else, they are welcome to leave their comments right here on the blog or email me at bobsadviceforstocks@lycos.com. I wanted to share with all of you my own disappointment at having to part ways with my recent purchase of 134 shares of Ecolab (ECL) that I had just purchased on 2/6/09 at a cost basis of $35.54. I sold these shares earlier today in the midst of the continued market correction at a price of $31.5948. This represented a loss of $(3.9452)/share or (11.1)% since purchase. (As I write, ECL is recovering somewhat trading at $32.04/share for a loss today of $(2.21) or (6.45)%. After an initial purchase of stock, my own trading strategy dictates a sale at an (8)% loss regardless of the duration of my ownership of that stock. And that includes selling shares after only 6 days! 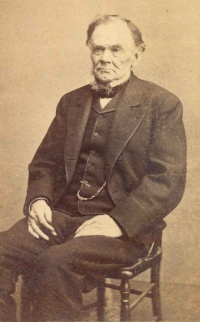 With this sale on a decline, which for me means a sale on 'bad news', I am back to my minimum of 5 positions and shall be 'sitting on my hands' with the proceeds of this sale--thereby moving once again a little more into cash and away from equities! What triggered the slide today was apparently the disappointment in the 4th quarter 2008 earnings results which were announced today. Excluding one-time expenses, earnings game in at $.45/share, unchanged from last year and in line with expectations of $.45/share. Revenue, which climbed 3% in the quarter to $1.48 billion from $1.44 billion was a bit 'light' from where analysts had pegged the company---$1.51 billion. In addition, the company reduced expectations about the current quarter, guiding now to $.30 to $.34/share, well below analysts' expectations of $.41/share. Even though full-year guidance was essentially in line with expectations, the disappointment on last quarter's revenue and the decreased guidance for the current quarter, was enough to make investors turn tail on this stock and resulted in my own sale as the stock hit and passed the (8)% loss limit for me. Thank you for visiting my blog and allowing me to share with you my own experiences, albeit disappointing today, in investing in this uncertain market. If you have any comments or questions, please feel free to leave them on the blog or email me at bobsadviceforstocks@lycos.com. PetSmart (PETM) and Ecolab (ECL) "Trading Transparency"
This really isn't a bad suggestion. It is far better to sell losing stocks than gaining stocks, but is it the best approach? Can't gaining stocks turn into losing positions (vis a vis my own WMS sale yesterday)? I work very hard to select stocks of what I would call the highest quality. I anticipate that they will appreciate in price yet I am prepared to limit their potential declines on the downside as well. In addition, I believe their actions are as much the fault of the market as my own poor investment selections! Thus, when a stock declines and triggers a sale I assume that there may well be something 'wrong' with the market environment and use that sale as a signal to 'sit on my hands' with the proceeds. (Unless of course I am at my minimum degree of equity exposure, which, in that case, I still replace that holding, but with a smaller-sized position of another stock which should be equally promising. And when a stock appreciates to one of my own appreciation targets, I sell a small amount of that holding (currently 1/7th of the position) and use that sale as a signal that not only did I make a great pick, but also that the market is acting 'healthy' and it might well be safe to expand my own exposure to equities with a new holding. Today my PetSmart shares hit one of those 'appreciation targets' and I sold 14 shares of my 104 share position. These shares had been acquired on November 20, 2008, at a cost basis of $15.58. My first targeted appreciation point is a 30% gain and with the stock trading at $20.47 today, I sold 14 of my 104 shares at that price and had a gain of $4.89 or 31.4% since purchase. This sale on the upside also generated a 'buy signal' for me and I went ahead and purchased shares of Ecolab (ECL). Ecolab (ECL) is an old favorite of mine. Most recently I wrote briefly about this stock on December 13, 2008, talking about the things I like to see in a stock. But before I get to that, I wanted to discuss my latest approach to 'position sizing' within my portfolio management strategy. Until recently, my position sizing was rather arbitrary. I thought about $5,000 for a position would be reasonable and then I purchased shares that hopefully were divisible by 7 to allow for a possible first sale. It was that bad! My greatest challenge was determining what to do with positions when I got down to what I call my minimum size of portfolio--5 positions. That is, when one of my minimum 5 holdings hit a sale point on the downside and I needed to sell that holding, my strategy still required me to buy another stock to replace it. But replacing one position with another of the same size (or even larger) would still cause me to compound my losses in an unrelenting bear market that we certainly have experienced. I decided that I needed to have some formula to select the size of my investment and since I still wanted to have five positions, the replacing position needed to be smaller to allow me to continue to reduce my exposure to equities even while maintaining the same number (5) of positions. I chose to replace holdings in my minimum portfolio with new stocks that were only 1/2 of the size of the average remaining holding. But what about new purchases on actual good news. That is, assuming I am at 15 positions, and less than 20 (my maximum), how much money should I put to work when I get a buy signal (as I did today)? My initial thought was to add new holdings equal to the average of the remaining stocks. But that wasn't aggressive enough. It could be possible that the size of the remaining holdings was quite small secondary to that extended bear market I discussed. Therefore, my current strategy is to continue to expand exposure to equities aggressively with 'good news' sales and purchase new holdings equal to 125% of the average of the other positions in the account. And that is what I did today with Ecolab (ECL). With my buy signal in hand, and that nickel burning a hole in my proverbial pocket, I purchased 134 shares of Ecolab (ECL) at $35.4776 this morning. I have bent the rules recently, not requiring the new stock I am adding to my portfolio to be on the top % gainers list at all. That list is a great place to find new potential purchases and I continue to do so on this blog. But I am reserving the right to assemble what I consider the very best of stocks in my portfolio including all of the ones I have discussed in the past. As I write, Ecolab (ECL) is trading at $35.73, up $.92 or 2.64% on the day. Briefly, Ecolab was selected because of the solid latest earnings report, a great Morningstar '5-Yr Restated' financials, and reasonable valuation. I like the business they are in--"products and services for hospitality, foodservice, healthcare, and light industrial markets....", and like Sysco (SYY), I hope they are relatively recession-resistant. Thank you very much for bearing with me as I reported on this trade and once again shared with you my own thoughts on dealing with portfolio holdings in as rational a manner as possible. Dolby (DLB) and Badger Meter (BMI) "Two Stocks: A Revisit and a New Name"
I am starting to feel a little of what I would call the normal functioning of the stock market. I say this in regards to what I would describe as the normal response to news. That is, stocks report great earnings and the 'Street' responds with a large news to the upside. This is what is supposed to happen in my book and is something that for the last six months or so has been relatively absent from the market action. It was great today to look at the list of top % gainers on the NYSE and see Dolby (DLB) an 'old favorite' of mine make the list closing at $30.18, up $4.31 or 16.66% on the day. I first wrote up Dolby (DLB) on Stock Picks Bob's Advice on January 7, 2008, and also purchased some shares that I held for a short period of time. (I do not own any shares of Dolby nor do I own any options presently). At the time of my write-up, Dolby (DLB) was trading at $49.21, so we can see the stock has along with the rest of the market been under pressure. 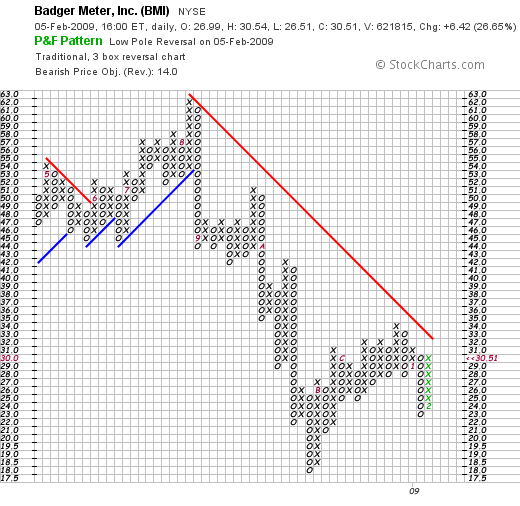 Let me explain why this stock and also Badger Meter (BMI), a new name for this blog, deserve a spot on this website. Besides making the list of top % gainers, they did this with great news. Dolby (DLB) reported 1st quarter 2009 results yesterday evening after the close. Earnings came in at $.68/share, easily exceeding estimates of $.43/share. Revenue also beat expectations, coming in at $180.3 million as compared to the estimated $164.9 million expected. To top this off, the company went ahead and raised guidance for 2009 earnings but did cut the outlook on revenue. Alex Davidson over at Forbes.com pointed out that shares were upgraded to "outperform" over at Pacific Crest Securities and that analysts anticipate that Microsoft Windows 7 will significantly add to earnings. What I really like about Dolby (DLB) isn't about the fabulous products they offer. I just really like their numbers on Morningstar.com with their "5-Yr Restated" page. I am impressed by the steady growth in revenue from $289 million in 2004 to $640 million in 2008. I like the earnings growth that has skyrocketed from $.43/share in 2004 to $1.70/share in 2008. And their relatively steady outstanding shares which did grow from 93 million in 2004 to 112 million in 2006 but through 2008 stood at a barely increased 115 million shares. Cash flow for this company is positive and solidly growing. They reported free cash flow of $124 million in 2006 and increased it to $152 million in 2007 and $251 million in 2008. The balance sheet is equally impressive with $395 million in cash and $297 million in other current assets. This total of $692 million, when compared to the $200.7 million in current liabilities yields a current ratio of 3.45. From my perspective a current ratio of 1.5 or higher is solid. The company has a relatively nominal amount of long-term liabilities totaling $86.2 million. 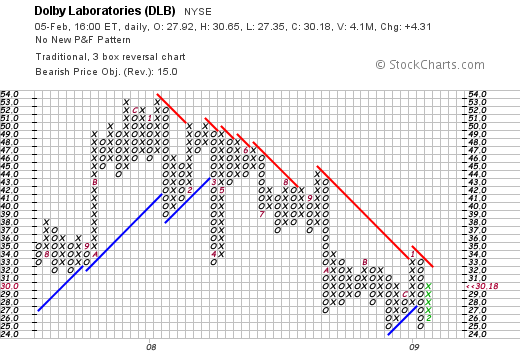 Like virtually every other tech stock on the market, Dolby (DLB) has been under pressure since early 2008 as this 'point & figure' chart from StockCharts.com demonstrates. The stock is far from overpriced and appears to have 'double-bottomed' at around $25. However, a price move above $33 would be more reassuring to me that this stock is showing any particular technical strength at all. Reviewing some Yahoo "Key Statistics" on Dolby, we find that Dolby is a mid cap stock with a market capitalization of $3.4 billion. The trailing p/e is only 17.36 with a forward p/e (fye 26-Sep-10) of 17.05. The PEG is a reasonable 1.12. In terms of valuation, the Fidelity.com numbers suggest that the Price/Sales (TTM) is rich at 4.53 compared to the industry average of only 0.93. However, in terms of profitability, Fidelity reports that the Return on Equity (ROE) at 20.59% almost doubles the industry average of 11.11%. Finishing up with Yahoo, there are 112.58 million shares outstanding but only 51.78 million that float. Currently there are 6.18 million shares out short (as of 12-Jan-09) with a resultant short interest ratio of 10.9 days. From my perspective, this is well above my own arbitrary 3 day rule for short interest suggesting that today's sharp price move might well have been a bit of a 'squeeze' of the shorts. No dividend is paid and Yahoo does not report any stock splits. Badger Meter (BMI) made the list of top % gainers today. They closed at $30.51, up $6.42 or 26.65% on the day (!). Basically they reported a terrific fourth quarter 2008 with solid revenue and earnings growth. They also have a terrific Morningstar.com "5-Yr Restated" page with steady revenue growth, earnings growth and yes (!) dividend growth. The free cash flow results are incomplete on the page but the 2007 results show $12 million in free cash flow. Their balance sheet appears solid with a current ratio of about 1.5. The 'point & figure' chart on Badger Meter from Stockcharts.com shows the stock price peaking at about $62 in August, 2008, only to dip as low as $18 in November, 2008. The stock price has been fighting back but like Dolby, I would like to see it above the 'resistance line' at about $32. In terms of valuation, according to Yahoo "Key Statistics" the stock has a trailing p/e of 20.94 with a forward p/e estimated at 19.81 (fye 31-Dec-09). This is a smaller company that Dolby, actually a small cap stock with a market capitalization of only $451.18 million. In terms of valuation, according to Fidelity.com, Badger has a Price/Sales (TTM) ratio of 1.31 compared ot the industry average of 0.77. The company is slightly more profitable than its peers as measured by the Return on Equity (TTM) which according to Fidelity comes in at 22.75% compared to the industry average of 20.17%. Yahoo reports only 14.79 million shares outstanding with 13.66 million that float. As of 12-Jan-09 there were 1.55 million shares out short representing 4.2 trading days of short interest--a little above my own '3 day rule' for significance. As I noted, the company does pay a small dividend of $.44/share with an indicated yield of 1.8%. The last stock split was a 2:1 split back on June 16, 2006 per Yahoo. If you read the Bob Herbert column from the January 29, 2008 edition of the New York Times, you might realize that the infrastructure stimulus might well include Badger Meter products in water projects (?). Anyhow, perhaps that is what the 'street' is thinking in dealing with this company! Anyhow, I feel like more of my old self today---finding firms on the top % list reporting great earnings and being rewarded for their financial success! Thank you again for visiting here and if you have any comments or questions, please feel free to leave them on the blog or email me at bobsadviceforstocks@lycos.com.